Come friend, and I will tell you of the people who were here before the white men invaded our lands. I will tell you of the ancient spirits that walk with our people, and of the vengeful ones that will bring about a Reckoning on the pale-faces. But the spirits demand that we return to the Old Ways. Those who abandon the natural ways of our spirit-fathers shall be counted as enemies, just as those who ride upon iron horses, kill from afar with cowardly rifles, and burn our villages with infernal devices inspired by demons! We were here before, and we will be here long after they have gone. 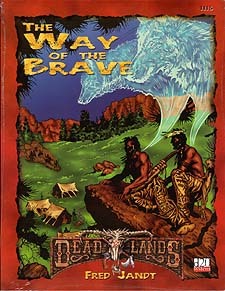 The Way of the Brave is a character-class book for Deadlands d20. Inside are new feats, skills, weapons of war, and guardian spirits for Braves and Shamans, as well as background information on the Weird West's tribes, the Old Ways Movement and their foes the Ravenites, their dealings with the USA and the Confederates, and new rules for playing Indians from dozens of tribes. You'll also find conversion guidelines for our classic Deadlands products to the d20 System. This product requires Deadlands d20 and the Player's Handbook from Wizards of the Coast.